As the recipient of a proposal, either public or private work, how do you ensure that you are getting the best quality for the best price? As a respondent to an RFP, how do you ensure that you are answering the RFP adequately, not overpricing it or being unresponsive? How do you ensure that your proposal makes it to the short list and gets an honest, impartial review? Listen to Richard Burnham and Mark Nagata to learn how anticipated and unanticipated costs are determined when using GMP, Design-Build and related project delivery methods [Integrated Project Delivery (IPD), Open Book Accounting (OBA) and Engineer, Procure & Construct (EPC)] and much more. 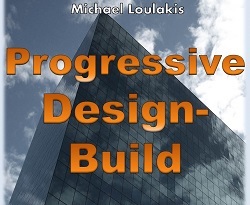 Progressive Design-Build (PDB) has become one of the most widely discussed concepts in the public sector design-build market. PDB not only allows owners to remain actively involved throughout the design development process, but also fosters a collaborative relationship between the owner and its design-build team. This program reviews the unique procurement, commercial and contracting issues with the process, and how PDB has been used throughout the country on both large and small projects. 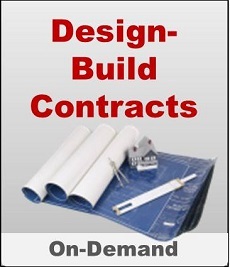 Design and construction agreements carry with them many obligations. Obligations may be in the form of duties, warranties or other covenants. Many of those obligations are stated in the written contract. However, contracts also impose certain obligations that may not be expressed in the written contract. These unwritten obligations are implied by law and courts and arbitrators enforce these obligations despite not being stated in the contract. As the recipient of a proposal, either public or private work, how do you ensure that you are getting the best quality for the best price? As a respondent to an RFP, how do you ensure that you are answering the RFP adequately, not overpricing it or being unresponsive? How do you ensure that your proposal makes it to the short list and gets an honest, impartial review? Listen to this informative program to learn answers to both questions and more. 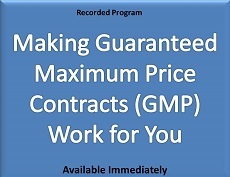 Topics will include an in-depth description and analysis of the advantages and disadvantages of this contracting format, the four phases of work that are typical when working under a GMP format, the components of a GMP& importance of each component. 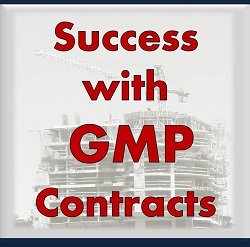 In addition, this program discusses the things to do and not do, administrative burdens placed on each of the partie, what a change is under a GMP contract, and how it is different than changes under other contracts and how contractors may need to change their standard subcontracts when working on a GMP project. Thinking of selling to the government, or want to win more contracts than you are now? There are 7 things that all winners do. Find out what they are, what to expect, and get the answers you need to get started today. 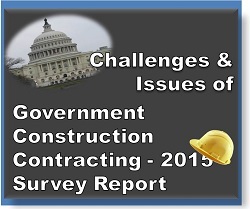 The survey also highlights differences in federal construction contracting vs. public contracting. Finally, specific comments and best practices provided by the respondents are included for use of both contractors and government employees. 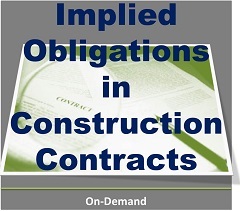 Unlike rules governing private sector projects, construction projects issued by federal agencies are subject to an extensive list of extra requirements under the Federal Acquisition Regulation (FAR). 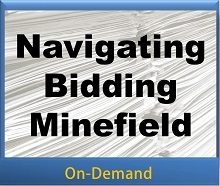 From small business classifications to surety bond issues, bid responsiveness to bidder responsibility, low bids to best value determinations, and the likelihood of disagreeing on some aspect of a procurement or contract award is high. 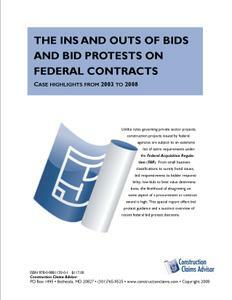 This special report offers bid protest guidance and a succinct overview of recent federal bid protest decisions. 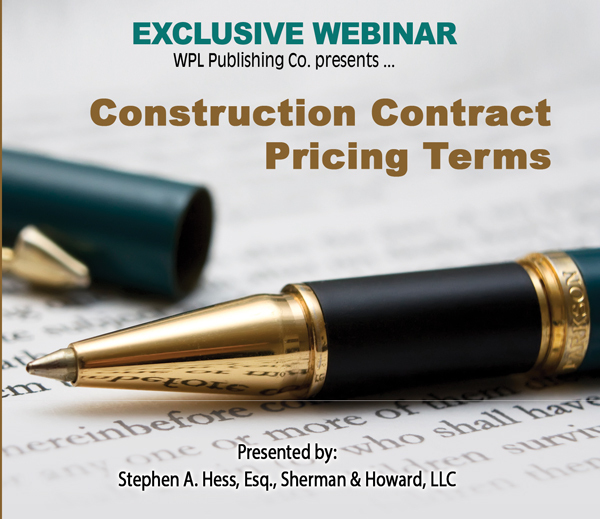 In this informative 90-minute webinar program, Stephen A. Hess of Sherman & Howard, LLC will present an overview of construction contract pricing terms, their role in allocating risks among the parties, and how parties can use pricing mechanisms to their benefit. Traditional construction methods, such as design-build, often put the owner and other parties at odds, which means that they often end up on opposite sides in court when things go wrong. However, integrated project delivery (IPD) is designed for collaboration and shared risk/reward from the beginning of a construction project. The traditional methods of passing along blame and responsibility are virtually eliminated from the equation and replaced with working environments that encourage parties seeking project success. Bringing together the owner, architect, and contractor on a level playing field is conducive to quality delivery. The fundamentals of this process ensure maximum efficiency and successful project delivery from all parties involved. The dramatic increase in federal construction spending has led many contractors to look to the federal government as an opportunity to expand their business during these tough economic times. While working as a federal contractor or subcontractor offers many opportunities, the rules governing contractor relationships with the government differ from the private sector. This training recording focuses on the recurring and troubling questions facing federal contractors and offers practical guidance aimed at simplifying the process of dealing with the government. 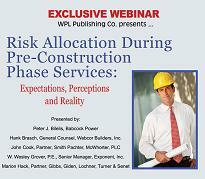 Learn what major construction companies already know -- active risk management techniques increase management effectiveness and improve project performance. 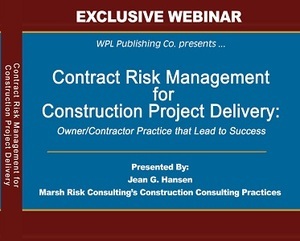 In this 90-minute CD, construction expert Jean Hansen will help you understand how risk management techniques improve governance on construction projects, resulting in reduced mistakes and improved judgment calls. 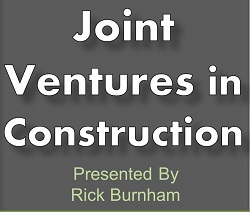 This recorded session will address the benefits of augmenting existing management programs used by the project parties during both pre-construction and construction phases. Project owners are seeking more involvement and participation in the pre-construction phase from construction managers and contractors. 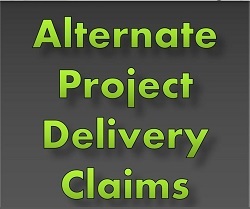 There is growing concern that as project delivery methods, such as integrated project delivery and design-build, demand that project stakeholders provide owners with input into many issues, such as schedules, budgets and design, their liability increases well beyond what was originally anticipated. Many firms are concerned that early involvement in the project may place an implied &ldquo;stamp&rdquo; of ownership or approval on the project&rsquo;s design and financial outcome without such risks being fully understood. Many construction owners are moving away from the traditional design-bid-build approach and shifting greater responsibility and risk to the constructor, resulting in less separation between design and construction services. This program will address the various project delivery systems, such as Construction Management, EPC/Design-Build, IPD and Public Private Partnerships, and the unique project execution risks confronting primary stakeholders. 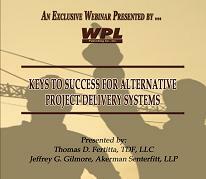 You will learn how alternative project delivery systems can affect the success or failure of a project with improved risk identification and resolution. In addition, expanded participation of the project team requires greater reliance on project control tools for scheduling and coordination. 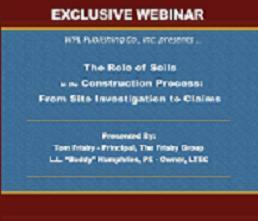 In 2007-2008, significant changes arose in the standard form construction contract. For the first time since 1997, the American Institute of Architects (AIA) issued wholesale revisions to the commonly used AIA Standard Form Documents. Around the same time, a group of 22 organizations released a comprehensive set of contracts and other forms known as ConsensusDOCS. Although these “form documents” have now been around for a few years, the debate continues as to which form should be used, when, and why. 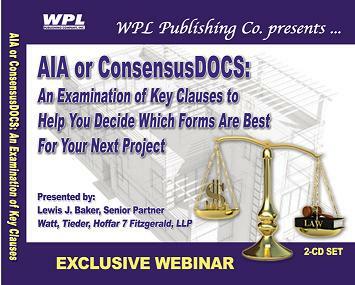 Attend this 90-minute presentation to learn and explore the key differences between the AIA and ConsensusDOCS contract forms, and to develop a better understanding of which “form document” best suits your needs. 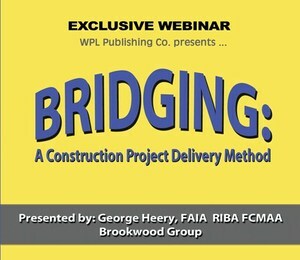 In an economy, where many owners are looking for ways to manage their projects more efficiently, The Bridging Method of project delivery helps owners greatly reduce risk and costs, while retaining full control of design and construction quality and detail. The tools of project delivery increasingly involve the exchange and merging of ideas and proprietary information in electronic form. That information is more often than not the subject of copyright and other intellectual property copyright protection. 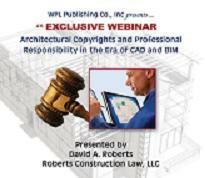 Although changes in technology can often outpace the laws and regulations governing design, construction, and professional responsibility in the digital age, understanding the framework of those laws in the context of building construction is important in order to assure orderly project delivery and the safety of those who build and use buildings. Delivering a high-performance building project is a challenging job. 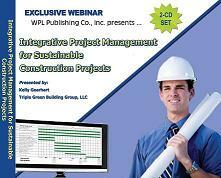 But your best chance for success is to develop best practices and processes for managing sustainable projects.